Fantastic savings on amazing destintations including Canada, New England, Hawaii, Mexico and many more. Book this amazing Mediterranean Fly Cruise for 2020 with a low deposit of just £50 per person and enjoy up to $500 per couple to spend onboard. Where do I use my Princess Cruises voucher code? Choose an offer from us here at NetVoucherCodes. Follow our link to the Princess.com website and browse around for your ideal cruise. Enter your required departure and arrival port, length of cruise and the dates you'd like to travel and click 'view results'. Choose your room and any other preferences and fill in your details. Once you get to the checkout section you'll see the deal you selected included in the overall price. You can then verify this deal and continue to complete your booking. Princess Cruises provide a number of cruises to destinations all over the world including Alaska, Asia, Australia, New Zealand, California, the Pacific, Canada, New England, the Caribbean, Europe, Hawaii, Japan, Mexico, Panama, South America, Antarctica and the South Pacific. With cruises that sail around all these locations as well as world cruises and many other ports of call available, you can travel across the entire globe with Princess Cruises while relaxing in the comfort of an on-board hotel that has all the amenities of home. Discover a huge selection of on-board cruise features that’ll make your travel experience unlike any other including fantastic food and dining opportunities, activities, entertainment, wellness experiences and celebrations and events. With so much to enjoy for adults, teens and kids, your whole family will be more than catered for on any Princess Cruise. Make sure your time on-shore is organised and worthwhile with the shore excursions available to plan and book through Princess Cruises. Maximize your exploration time and enjoy the best price on each shore excursion, in every port your dock at, with dining and drinking opportunities, sightseeing experiences and discovery tours all available to book online, alongside your cruise. Plan intimate small group tours with a party of your choice and discover once in a lifetime experiences, local culture, iconic sites, monuments and much more in every destination you sail to, with a guaranteed ‘return to ship’ promise that ensures your cruise will wait if your tour runs late. So whether you’re looking to soak in Italy's spirit on a visit to a pasta factory in Sorrento, you’re looking to discover the modern and classical influences of Helsinki, or you want to become personally acquainted with sharks in Hawaii or sloths in Costa Rica, you can plan and book it all at Princess Cruises. Princess Cruises ensure that your onboard experience is as carefree and enjoyable as possible with things like relaxing pursuits, enriching activities, world-class entertainment and gourmet cuisine, available on every single ship, in every corner of the world. Enjoy hit shows such as Shark Week, Finding Bigfoot and the Deadliest Catch, celebrate with the festivals of the world evenings and take part in destination themed activities like Hula dancing and street pan drumming. You can also get more out of your travels with engaging multimedia presentations by local destination experts and unwind at the end of the day with culinary demonstrations and wine tastings, that are equally enjoyable and informative. If you’re looking for a little more luxury you can also discover world-class gaming in state of the art casinos as well as extensive art collections in the top-notch art galleries and lecture rooms throughout your cruise ship. Can I smoke onboard my cruise? Yes. There are a number of “Designated Smoking Areas” available onboard your ship, these will include a sufficient number of ashtrays that are emptied regularly. What is the onboard currency? Unless noted, onboard currency is in US dollars. However, on select Australian-based itineraries, the onboard currency is in Australian dollars. Is there internet onboard Princess Cruises cruise ships? Internet access is available on all Princess' vessels through the 24-hour onboard Internet Cafe and wireless network — which is available in some staterooms and various public areas including the world famous Piazzas. Princess Cruises is one of the top cruise providers in the world, supplying fantastic experiences in countries all over the world as well as a transport service like no other; allowing you to enjoy a relaxing and fun filled holiday both on your ship and when you dock. Princess Cruises allow you to find and book your cruise and cruise tours as well as shore excursions in every port you’re docking at. They also provide online planning assistance in the form of travel agents, personal cruise specialists and free brochures. 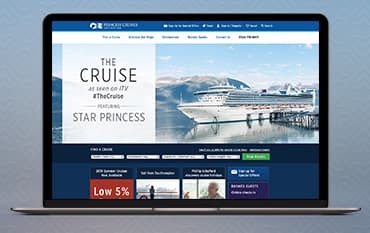 Start planning your dream cruise online at Princess Cruises and use a discount code from us, here at NetVoucherCodes, to save money on your booking. We are constantly on the hunt for Voucher Codes for Princess Cruises to help you with your money saving. Our experts check dozens of sites for secret codes including NHS discounts, student sites & social media channels saving you time & money!